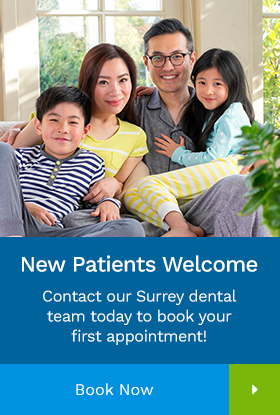 Your Surrey dentist and dental hygienist will evaluate for periodontal disease and recommend the appropriate treatment. How is gum disease treatment conducted? If the disease is caught in the early stages of gingivitis, and no damage has been done, one to two regular cleanings will be recommended. You will also be given instructions on improving your daily oral hygiene habits and having regular dental cleanings. This procedure helps gum tissue to heal and pockets to shrink. Medications, special medicated mouth rinses, and an electric tooth brush may be recommended to help control infection and healing.